Wash and go curls, loose buns, braided 'dos and faux locs seem to have replaced traditional glam hairstyles on local and international red carpets. For as long as lush wigs that cascade down your back are available for all of us to enjoy, there will never be a shortage of them on the red carpet. And we'll always be here to appreciate those 30-inch bundles when we see them. However, it's also worth noting that ever since more of us starting embracing natural hair, we also thought it fit to don natural hairstyles on special occasions too. Without meaning to sound political at all, I would even opine that perhaps black women are decolonising formal spaces that previously had us believing natural hairdos are unacceptable or are too "unkempt" for those spaces. You might be reminded of how up until very recently, black Miss SA finalists would all have their hairstyles of choice swapped out for the same long, bouncy wig style at the pageant finale, regardless of whether it suited their face shape or not. With the exception of stars with dreadlocks, awards evenings have always been reason for our celebrities to debut a new weave/wig. And taking it as far back as your matric dance, it was almost mandatory to wear a weave as a black girl even if your usual teen aesthetic was not all that "girly". Of course, hair is a personal choice and individuals who opt for hair of a straight variation are by no means "sunken" (for lack of a better term). This is merely an observation of how now that we have more options at our disposal, more women are comfortable with going for the hairstyles that were previously deemed inappropriate for corporate spaces or to complement a designer dress, let alone the likes of Ralph & Russo and Vera Wang gowns. This is why this past weekend's hairstyles from the Sun Met and the Screen Actor's Guild red carpets respectively were refreshing. For example, Lupita Nyong'o was sporting beaded braids and an undercut - a lovely sight sight you might have never seen a mainstream A-list black celebrity parading on a red carpet about 20 years ago. 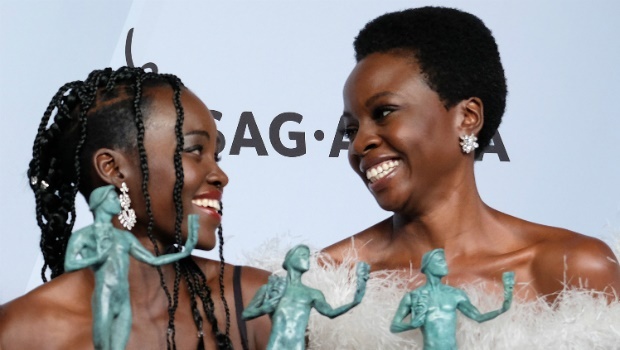 Lupita's Black Panther co-star, Danai Gurira, has been natural for as long as she's graced prestigious red carpets and the SAG Awards were no different. Grownish star Yara Shahidi let hair glorious mane out as well. I don't wanna hurt nobody~We just came here to party?? This is Us actress Susan Watson also often gives us hair natural hair envy on the red carpet. And in terms of defying ideas of neatness on the red carpet, Orange is the New Black's Laverne Cox, gave us a relaxed braided bun that you can swiftly take from daytime to evening. Back home at the Sun Met in Cape Town, local celebrities and influencers also showed off a variation of natural hairstyles. And it seems big-ish hair had a moment on the racecourse this past Saturday. New (and some that we already know and love) short crops were also debuted on the Sun Met red carpet. Plus, you can never go wrong with a good set of braids or faux 'locs. I came. I saw. I conquered. ??? #QueenMother #NeverForget #Iconic • • • ?? : @imprint_za ????‍?? : @candiandco_bluehills / @candiandcosalon ????‍?? : @nomsamadida ?? : @ditsaladesigns #SunMet #SunMet2019 #NextVictory??? ?